Made with lemons. Mousse whipped for creamy bubbliness. Our mousses are made in Somerset and whipped with British cream. 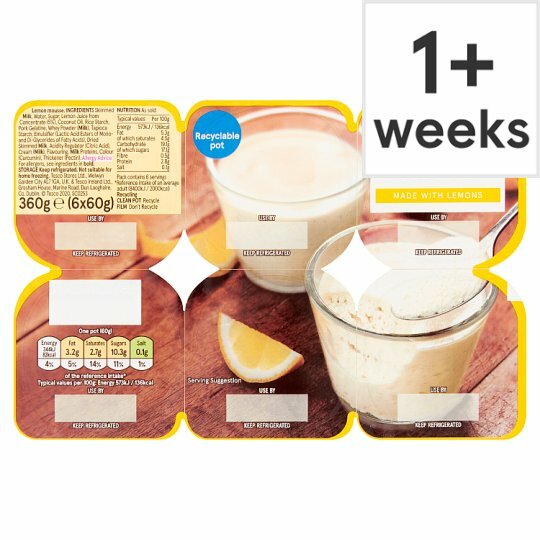 INGREDIENTS: Skimmed Milk, Reconstituted Whey Concentrate (Milk), Sugar, Coconut Oil, Lemon Juice from Concentrate (5%), Water, Cream (Milk) (2.5%), Pork Gelatine, Rice Starch, Tapioca Starch, Emulsifier (Lactic Acid Esters of Mono- and Di-Glycerides of Fatty Acids), Dried Skimmed Milk, Acidity Regulator (Citric Acid), Milk Proteins, Colour (Curcumin), Flavouring, Thickener (Pectin).